The artist [1867-1947]; by inheritance to the Bonnard-Terrasse family, Paris. Anonymous collection, Los Angeles. (Wildenstein, London, New York, and Paris); sold 15 June 1965 to Ailsa Mellon Bruce [1901-1969], New York; gift 1970 to NGA. Inheritance cited in catalogue raisonné by Dauberville, vol III (1973), no. 1583. French Paintings from the Collections of Mr. and Mrs. Paul Mellon and Mrs. Mellon Bruce, National Gallery of Art, Washington, 1966, no. 168, repro. Pierre Bonnard, Städelsches Kunstinstitut und Städtische Galerie, Frankfurt am Main, and Kunsthaus Zürich, 1984-1985, no. 150, repro. Loan for display with permanent collection, Museum of Fine Arts, St. Petersburg, Florida, 1987-1988. Extended loan for use by Secretary Robert Mosbacher, U.S. Department of Commerce, Washington, D.C., 1989-1993. Extended loan for use by Secretary Ron Brown, U.S. Department of Commerce, Washington, D.C., 1993. Bonnard at Le Bosquet, Hayward Gallery, London; Laing Art Gallery, Newcastle upon Tyne, 1994, no. 50, repro., as Steps in the Artist's Garden. Masterpieces from the National Gallery of Art, Washington, Kyoto Municipal Museum of Art; Tokyo Metropolitan Art Museum, 1999, no. 70, repro. Pierre Bonnard: l'oeuvre d'art, un arrèt du temps", Musée d'Art Moderne de la Ville de Paris, 2006, no. 81, repro. Bonnard and Le Cannet. 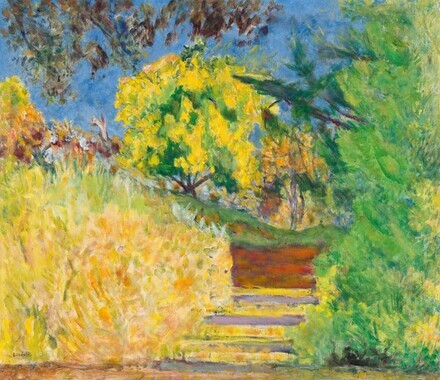 In the Mediterranean Light, Musée Bonnard, Le Cannet, 2011, no. 67, repro. Pierre Bonnard, Fondation Beyeler, Basel, 2012, unnumbered catalogue, repro. Dauberville, Jean, and Henry Dauberville. Bonnard, Catalogue raisonné de l'oeuvre peint. 4 vols. Paris, 1966-1974: no. 1583, repro. Goldwater, Robert. "The Glory that was France." Art News 65 (March 1966): 47, repro. Young, Mahonri Sharp. "The Mellon Collections: The Great Years of French Painting." Apollo 83 (June 1966): 434, repro. European Paintings: An Illustrated Summary Catalogue. National Gallery of Art, Washington, 1975: 34, repro. Walker, John. National Gallery of Art, Washington. Rev. ed. New York, 1984: 578, no. 886, color repro. European Paintings: An Illustrated Catalogue. National Gallery of Art, Washington, 1985: 54, repro.